I was going to pop this on the bike forums before I quickly realized that (in some sensible way) all the no-knowledge weenies hang out there, while all the more technically inclined are strangely united by the manufacture and consumption of fine alcoholic beverages. For the past couple years, my stock response to stuff like this contains mostly just a system to clean dirty air. Literally: Why don't we just wash the air? I'm curious if anyone has any real commentary on this. So, you burn wood, coal, oil... and lots of blackness comes out. How horrid. It's mostly particulate: mercury (liquid at cool temperatures, gas at warm), soot, ash, sulfur aerosols, the like. The rest is CO2, nitrous oxides, CO, and gaseous sulfur compounds (H2S and H2SO4, particularly). Most of the gases are harmless, but sulfur compounds can produce acid rain. Mercury turns to gas easily, and in that state it poses a problem; typically it exists as a gas in exhaust output, rather than a particulate as I've categorized it. Pressurize the exhaust. flow it through a water-filled channel shaped such that turbulence occurs when air pressure is pushed through, but only bubbles on its exit (i.e. water isn't forced out the top). Heavy particulate will wash out as the water churns and mixes with the air, giving you an eventually murky and muddy collection of soot, ash, and aerosols; just flush this water out, dump it into the ground water. It's mostly safe. Mercury, as a gas, will pass through this; the water heats up from hot exhaust. The water at least becomes acidic; at worst, passes sulfur gases. Some compounds may prove toxic--mercury particularly. A large amount of waste comes out of factories and power plants; you will get tons of ash, and you will need to use a lot of water. To handle the first, I recommend a geothermal cooling pump acting as a condenser. Replace with any other, more effective condenser (even a thermocouple). Basically pump closed-loop water down 10 meters into the ground and then up around the output exhaust. Gaseous mercury will cool, condense, and drip out as liquid mercury. Extract (drain) from the exhaust system by means of a tank at the base, with a valve at the bottom to draw mercury off when the level goes above a certain volume of collected mercury. To handle the second, add lime to the water when it is introduced, and when the acidity increases to a certain point. I have no idea how to measure acidity in this environment. Let the engineers figure out how to buffer it properly; do you honestly expect me to solve all the world's problems myself? Once it's done, acidic gases and aerosols will react and neutralize. The third requires more thought. Mercury is easy: some will remain in the water, but if you chill it on the way out you'll get a pool at the bottom. Remove that. Any other toxic compounds? You have to react or remove them by some magic. Distillation may work, but produces too much waste; remember, soot and ash make excellent nutrients and also comprise the majority of contamination. It's advantageous to reuse those products as fertilizer rather than store and dispose of them as waste, but extraction may prove expensive in the event of non-mitigatable toxic contamination. Reacted acids are harmless, as is lime. The last is relatively easy. After all treatment to neutralize and remove poisonous waste products, distil the waste water and reuse. You get solid waste and fresh filtration water. As a bonus, you can roughly ignore mercury, and thus do the distillation hot: pull hot water from the washing chambers, dump reservoir water into the chamber, distill hot water and dump the output (water, mercury) into the reservoir chamber. The reservoir chamber now contains mercury, which gets dumped into the washing chamber where it heats up and vaporizes. The mercury vapor goes out... into the condenser. Continuously reuse the mercury water while extracting the solid wastes (soot, aerosols) via distillation. Does anyone have any thoughts on the whole thing? It's a simple solution (washing) to a simple problem (dirty air). Some more extensive steps (mercury condensation, pH buffering, distillation to convert liquid waste into solid waste) come into play later. I worked for a chemical company in the 70's that did exactly what you described. Its called a scrubber. We incinerated chemical waste with everything imaginable in it including mercury and other toxic metals @ 2200f and the hot gas stream ran through a boiler to generate steam for the rest of the complex. Prior to the boilers it ran through an "EFB" - Electro Static Filter Bed - which was basically a big can about 8 ft in diameter and 10 ft tall that had electric coils in it. It was supposed to make a lot of the heavy metals and other particulate drop out into a big ash can underneath. This would be sealed and buried in a haz landfill. The gas stream then went into the scrubber. It was made of fiberglass. The bottom was a disk about 12 ft in dia and 6 ft tall. A fiberglass stack about 4 ft dia and 30 ft tall came out the center. The gas stream went in at the bottom and bubbled up. It was filled with water flowing water with pH sensors and had a sodium hydroxide line hooked up that "tried" to keep the pH neutral. Gases (they claimed nothing but co2 - yea right) came out the stack and the "clean and neutralized" (remember the EFB got the particulate) water flowed out the scrubber to the river. IIRC fish kills were common plus everyone in the neighborhood down wind complained of breathing problems. At least that's what they said in the federal lawsuit. 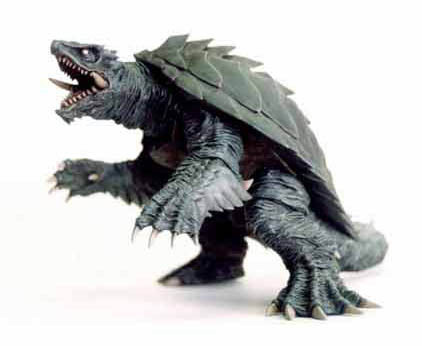 What I wonder is this...............Does any one here besides me still like turtles? I hear they make good soup. Only if they leave small carbon footprints.